Romeo and Juliet. Hamlet. Macbeth. Everyone has heard their names. Everyone knows their stories. But you’ve never seen them like this. 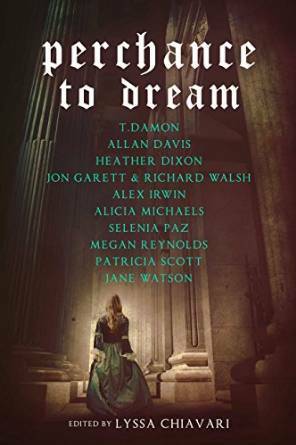 In this collection, some of the hottest names in YA today reimagine ten of Shakespeare’s best-known plays and sonnets for a new audience. From sci-fi adventures on distant moons to modern magic found in everyday places, these updated myths pay homage to the Bard’s timeless storytelling while spinning fresh and original tales that will captivate readers all over again. On assignment in London, FBI Agent Morgan Nash finds himself moments away from a bullet through the heart when the case he’s working goes awry. But fate has other plans, he discovers when he wakes in a world far removed from his own. At work cataloguing ancient manuscripts in the British Museum, Ezra Glacenbie inadvertently creates the magic that pulls Morgan out of the twenty-first century and into the nineteenth. It’s an impromptu vacation which may become permanent when the spellbook goes missing. Further upsetting Morgan’s search for a way home is the irresistible temptation to investigate the most notorious crime of the nineteenth century. But it’s the unexpected romance blossoming between Morgan and Ezra that becomes the most dangerous complication of all. Adam Craig is burned out. Lead singer of the hard rock band Black Varen, he’s tired of the empty life of groupies, paparazzi, and hotel rooms. Worse, a life in the closet. After the final concert of their latest tour, he flees the after-party in pursuit of memories of lost summers and carefree days, until he passes out on the patio of a shuttered lake resort. Miles Caldwell is a brilliant artist, tied by agoraphobia and social anxiety to his family’s lodge. Alone but for his parrot, he spends his days illuminating manuscripts and hiding from the complexities of life. When he discovers Adam asleep in a deck chair, he’s furious but intrigued. Adam soon charms his way into Miles’ bed, and they lose themselves in a summer idyll, safe from the compromises and claims of reality. But Adam’s life, with all its demands, is waiting for him. And Miles, uncertain of Adam’s true feelings, is battling demons of his own. Somehow, the man who’s never home and the man who never leaves it must find the strength to fight for a future together.